Could it be more simple?……..not in housing law-land. You have to look in two places for the full picture. The ground as written above but also further guidance in Part III of Schedule 2, Housing Act 1988. Now let’s pick it apart. It’s the first of the discretionary grounds for eviction, in other words, even if you can prove the ground the judge still has to go on to consider whether, in the circumstances it is ‘Reasonable’ to grant possession. If the tenant is on an Assured Tenancy then they can’t be moved to a property under an AST. A landlord can increase the level of security but not reduce it. This element would also apply to other members of the tenant’s family living with them. Interestingly the seminal book on these matters “Defending Possession Proceedings” informs us that in certain cases it has been considered that it is possible that a lodger could be deemed a family member for the purposes of the suitable alternative accommodation ground. The wise landlord would do well to check the case law on this in detail. A property would be unlikely to be considered suitable if the tenant lived 1 mile from work and the offered property is 10 miles away. You would expect the condition here to mean that the new accommodation being offered would match the original but there is more to it than that. The comparator is solely for living space and does not include extra space unless it is for the purpose of the tenant’s business. So for instance being moved from a property with a particularly nice garden to a paved over monstrosity may not provide a strong basis for a challenge. You would expect that a defence could be raised if the property being offered is not of the same size as the original but this is not always the case, nor is it always true that an inferior property would not be considered a suitable alternative. A landlord does have the added option of being able to produce a local authority certificate for the area that the accommodation that is currently being occupied is located, showing what the council would provide to a tenant or family of similar size and circumstances. Courts can accept this as proof that the accommodation on offer is a suitable alternative. The case of Redsprings v. Francis (1973) is a really interesting one to examine here. (If you have the “Housing Law Casebook” it is case G25.11) The landlord was offering alternative accommodation, moving the family from a quiet residential road with a garden, to a property with no garden, on a main road, next to a fish and chip shop. The tenant defended on suitability, citing the noise and smell of the chippie, and the loss of the garden. The judge granted possession saying he couldn’t take into account environmental factors as a comparator but was overruled by the court of appeal who held that environmental factors can count towards suitability of alternative accommodation being offered. Then there is the case of Battlesprings v. Gates in 1984 where the accommodation being offered was fine, but the tenant had lived in her home for 35 years and it had ‘tender memories’ for her. The Court of Appeal upheld the Judge’s initial decision to exercise his discretion and refuse the order for possession. Part III also specifically refers to a property not being suitable if it would be overcrowded. Which is a bit obvious really. Advocates need to really concentrate on the sub-sections in Part III to Schedule Two outlined above and the raft of case law that applies to this ground. Unlike ground 8, defending this one isn’t a simple numbers game, it’s about fact and degree and a finely balanced comparison of a range of factors from room sizes and location to the definition of family members and consideration of environmental factors. In short, get your law books out. I thought I would chip in here as my last ‘proper’ litigation case was evicting a tenant under the suitable alternative accommodation ground. The case involved a large house which the landlord’s daughter allowed a friend to stay in for a holiday in the 1970’s when she was fleeing an abusive husband. Needless to say, they were then reconciled, the husband moved in and they were still there, as protected tenants, 30 years later. It was a large 6 bedroomed house adjacent to the family farm, which had previously been used for the farm manager. The family wanted it back for their son to live in as he was going to manage the farm. The family had been advised that as the tenants were protected tenants they would never be able to get them out, but I thought we could do something with suitable alternative accommodation. The son therefore sold his house and bought a very nice modern two bedroom property for them close by, which we offered to them (along with a notice to quit). The tenants were initially minded to refuse as they liked living in the big posh 6 bedroomed house, but as Ben says above, they were only entitled to be rehoused in a property of suitable size for them – such as they would get if they were entitled to council housing. On advice from their lawyers, they eventually caved in and agreed to go. However as a leaving present, they left the tap running in the bathroom when they left. Thankfully the son was on the alert and was able to get in and turn it off before too much damage was done. Nice people. An interesting case which shows what can be done. My view is that if you are a landlord needing to evict a protected tenant, assuming they pay their rent (and no protected tenant is going to risk losing their protected tenancy by not paying the rent) suitable alternative accommodation is your best, and probably your only, option. 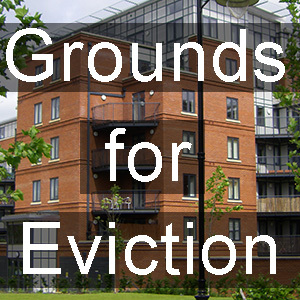 Landlords wanting help with eviction claims against tenants should click here. How can we, as landlords deal with situations when the housing departments in councils – particularly Luton, are instructing tenants to stay put until they are evicted so as to be re housed by the council. It doesn’t matter that the courts are taking ages to act and we, the landlords end up being out of pocket for thousands while the tenant just laughs at us!!!! It is tantamount to us paying extra taxes. The laugh really is on us!!! Very interesting tactic in relation to assured tenants. I had not thought of that before. On a related note, the Housing Law Casebook if it is the LAG one you are able to get access for a limited time online for free. What I didn’t understand in Tessa’s note was why didn’t the tenants contest on the basis that the character of the alternative accommodation was very different to the one that was offered. If you mean that they lost a posh property for an ordinary property – poshness is not a character that they are entitled to have in a replacement property! It just needs to be suitable and appropriate. The replacement property was very nice with central heating (which I don’t think the original property had) and a new kitchen and bathroom etc and was in the same geographic area. It was (apart from not being a posh 6 bed property) arguably more suitable for them than the original house. It also had two bedrooms whereas they were actually only legally entitled to insist on a one bedroomed property. Believe me, if they could have contested it they would have done so. They were however represented by both solicitor and barrister who obviously advised them that they had no chance. Ok, what is the understanding of ‘character’ as Ben highlighted in the article. like the example of the one who has private garden and then is offered a property with no garden of whatever sought. It depends. It is a discretionary ground so it will really be up to the Judge and whether he considers the replacement property proposed is suitable in all the circumstances. NB The reason why the landlord requires possession will also be taken into account. In my case, the family required the use of the property for the farm manager (which was its original purpose when it was built). I have read some case law in relation to the ground, in one case a judge decided that because the alternative accommodation was near a chip shop it was deemed unsuitable and another case because the alternate property didn’t have garden….